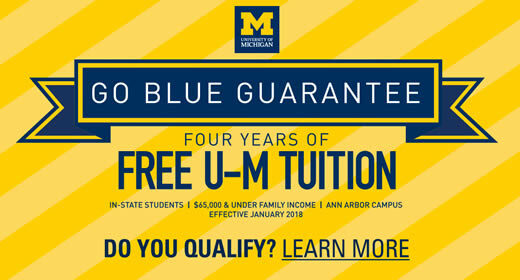 Mark Schlissel, president of the University of Michigan, recently announced the “Go Blue Guarantee,” which pledges four years of free tuition for admitted in-state students whose families earn less than $65,000 per year. The program is based, in part, on early results from the HAIL Scholarship pilot program, which was designed in collaboration with Ford School faculty member Susan Dynarski, whose research is focused on reducing educational disparities. "We now guarantee those with the most need can afford a University of Michigan education," Schlissel said. "The Go Blue Guarantee cuts through the complexities of financial aid to help us reach talented students from all communities in our state. I've always believed that talent is ubiquitous in our society, but opportunity most certainly is not." Two years ago, the HAIL Scholarship pilot made a similar pledge to high-achieving, low-income students across the state of Michigan. Early results from the pilot showed that the scholarship's simple design and pledge were effective tools for attracting applications from talented Michigan students with demonstrated financial need. "We are making a commitment in order to make sure in-state students have access to the life-changing educational opportunities at a large research university like U-M," says Acting Provost Paul Courant of U-M’s new Go Blue Guarantee. U-M’s Go Blue Guarantee is making the news in Michigan and across the U.S.